This surgical side rail clamp can be attached to virtually any operating table. 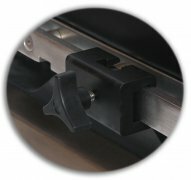 Strong, light, and easily attaches to any standard surgical table side rail. Provides a simple and quick method for attaching and removing surgical accessories.